Petr Bambousek | Wildlife Photography | Behind the lens – Thailand I. Behind the lens - Thailand I. 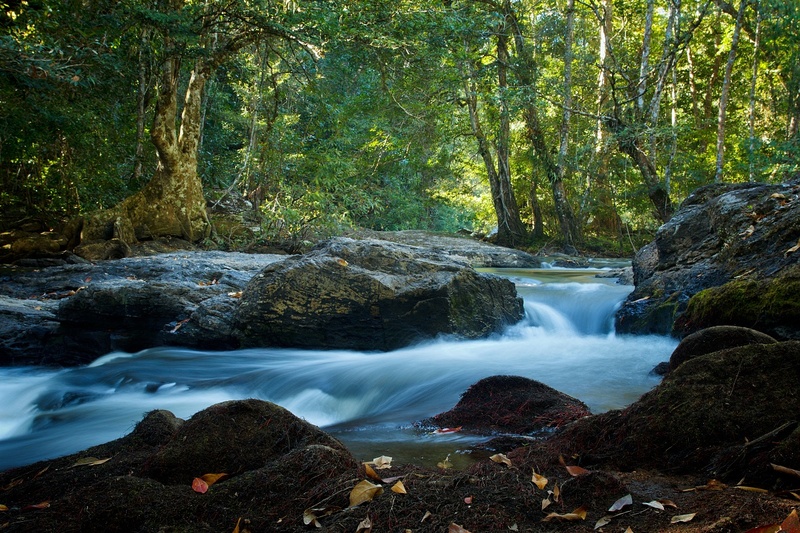 Behind the lens – Thailand I. When I was planning my trip to Thailand, I placed an ad on my web with no definite details for the itinerary. I envisaged wandering aimlessly without any concrete milestone so that we make the most of every single opportunity on the spot. Different type of photographs should’ve been therefore taken – photographs that were not pre-planned but based on luck. Some may say that it’s a useless whim, but I personally liked this style of photographing. Despite my rough research regarding potential locations, our expedition was, however, struck by unfortunate events that no one could plan for. At the time of our visit, Thailand was hit by the worst floods Thailand experienced in the past 70 years and most of our pre-selected locations were temporarily destroyed. I managed to adjust our itineraries accordingly but that only added yet another level of unpredictability. However, only thanks to these circumstances I was able to take a shot of a drongo on the moon as we were staying in a totally different location than we originally roughly planned for. We lived in a small hotel close to local wetlands and the morning ritual was always the same. We got up every day at 5 and went straight to the wetlands looking for secret places where we could take some decent shots. We’d waited for hours. One day, the guys went earlier and even though it was still dark they disappeared behind a bend. Under a bright moonlight the wetlands were slowly waking up. Attaching my camera to a tripod I hurried to catch up with the boys that were way ahead of me. In a corner of my eye I caught some bird landing on a branch quite afar from me. It was an ashy drongo (Dicrurus leucophaeus) that is fairly common albeit very shy. 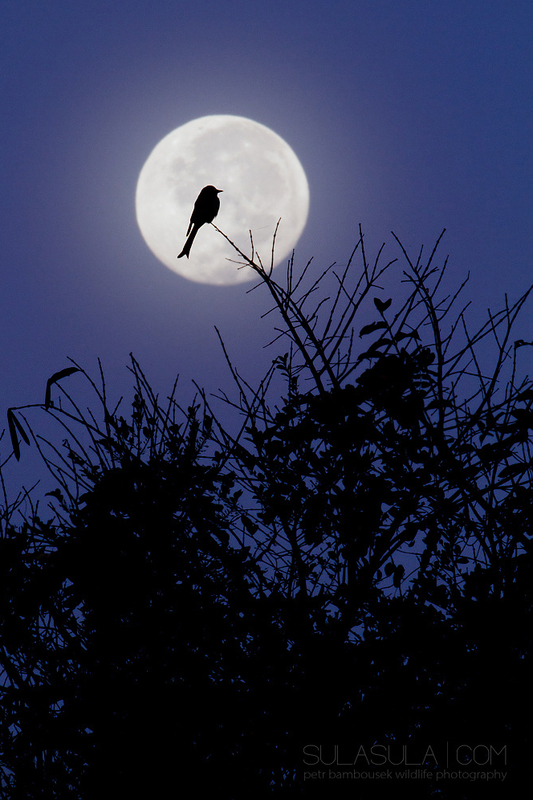 Excited I started setting up my tripod only to notice that the moon was perfectly aligned with the bird. I’d set the highest aperture possible (32), aimed at it but the moon was no longer aligned. The moon was too low. I moved two steps closer and the composition seemed to work. I moved my tripod and … nothing. The moon was slowly moving towards a horizon. In these types of shots every millimetre counts and I wanted to shoot it so that the bird won’t touch the outer rim of the moon and is perfectly centred. Panicking a bit, I started to recompose in my head. I could perfectly see a photograph but was unable to take a shot of it. After a while, I found a spot where the moon was optically still above the bird. I aimed and waited. Soon, I realised that the moon is not moving and that I need to recompose again before my exposure time changes. But when I glanced back at the branch, the drongo was gone. Frustrated, I stood frozen solid for several seconds. Lucky for me, he flew right back in and stylishly landed where he used to be. For a split second, the moon was where I wanted it, the wetlands were disrupted by three very quiet shutter clicks and the moon rolled away from the composition. When previewing my shots I couldn’t even breathe. I love it to bits. More so, that without the floods it would actually have never come to existence. The photograph was awarded a prize in a prestigious Czech photography competition. We spent our last days in Thailand near local wetlands close to Bangkok. I was sitting in my ornithology lookout dreaming about a photo of puffy scarlet morning clouds reflecting in the water with two stilts in the foreground. Unfortunately, the sky was that morning far from my dream and the weather was more than dreary. Probably the worst I experienced during my entire trip. I even felt a bit cold as the lookout was a tad drafty. All the birds were miserably far away and so I just sat and sat and enjoyed the view. Every now and then an egret would fly by but just by glancing into my viewfinder I knew that even with ISO 800 I won’t get a better exposure than 1/80s. Slowly but surely the great egrets grew in numbers and started to land everywhere around me. I practised shooting their path of flight and then it came to me – if I was limited by a long exposure than why not make it a really long one? I set a time priority to 1/10s and took a few mock shots of flying egrets against a line of trees in the background. What was coming out were very interesting abstracts that changed depending on how quickly I yanked my camera. I ended up enjoying the unplanned panning game and started to pan animal free smudges that I occasionally do for fun especially in autumn when the trees are full of colours and textures. 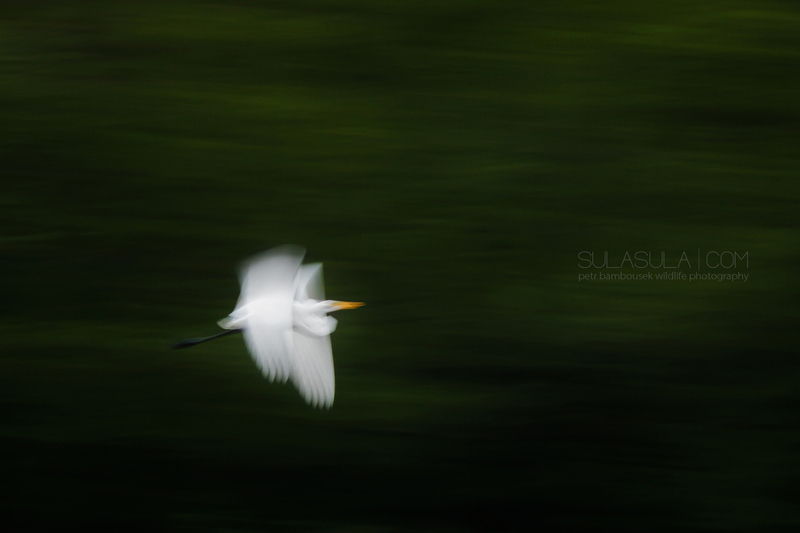 The great egrets were still coming and this time I stretched the shutter speed to yet another extreme. I had about 30 attempts of which I really love the photograph below. This is to prove that even bad weather and lower light lens can deliver unexpectedly great results. On hearing a sound of a hornbill I darted out to find him. I grabbed my rucksack and disappeared in the woods. I found him hopping high in the treetops flapping his wings which made a very specific sound and puff … a second later he was gone. Nothing unusual, I know. I experienced similar account of situation countless of times and came to a conclusion that photographing him from a decent distance is practically impossible. Also in the distance, I could hear gibbons, which, however, left me cold and I continued walking along a rocky stream making his way through a rainforest. I sat on a rock and observed a beautiful green damselfly that I photographed two days ago. I felt really peaceful and I wanted to immortalise that moment on a photograph. I reached for my tripod but it was nowhere to be found. Of course, I thought, I grabbed my rucksack but not my tripod, dah! Being too lazy to go back for it, I started searching for something to be used in its place. I found a suitable boulder on which I placed my camera and pointed at the scene. I needed to lift the lens a bit by underlying it with a pebble. The problem was that it was all askew and so I wedged a tiny twig in between my camera and the boulder to secure it in place. I needed to reposition it a little bit to the right which made the pebble no longer suitable. I looked for a new one that I carefully placed under my lens. Perfect! All that was needed was to adjust my polarising filter and … I smudged it with my finger. So after all this, I had to take my camera off my complicated substitute tripod, take of my filter, clean it and put it back again, place my camera back on the boulder and wedge a pebble back in. But where was it? Grrr, need to find yet another one. I placed a twig underneath the camera to even the horizon and a new pebble to lift my lens. Then I set a timer … held my breath and … click.